Safe Step is the premier walk-in bathtub and shower provider in the United States. What we like about Safe Step is how they include bathroom modifications, plumbing and electrical work and installation in the cost of their walk-in tub quotes. If customization, safety and the perfect fit are your top concerns when purchasing a walk-in tub, Safe Step leads the industry with personalized shopping and installation experience. Safe Step Walk-In Tubs are equipped with standard features that are often considered optional upgrades when compared to other tubs of this type. That’s the reason we rated Safe Step the “Best for Arthritis and Joint Pain” winner in our walk-in tub buyers guide. Because every home is different, each Safe Step tub is customized to meet the size and design needed for the project. The company’s tubs are manufactured in the United States, come with a lifetime warranty, and according to company representatives are the #1 choice by sales volume for the product category. 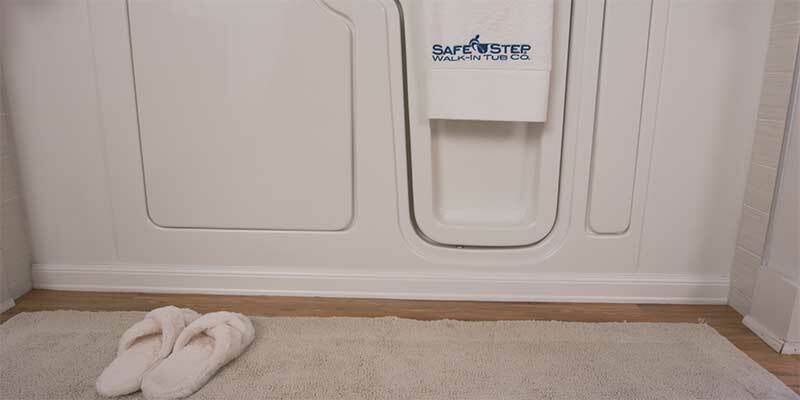 Safe Step walk-in tubs are an investment in the comfort and safety of the homeowner. The company was reluctant to share prices with us, because like any construction project, costs will vary depending on the size and scope of the project. As a point of reference, most Safe Step models start at $10,000 for the walk-in tub, including shipping and installation. After deciding to purchase a Safe Step tub, the Safe Step team handles everything from delivery to installation and hauling away your old tub or shower. Safe Step makes all the arrangements for their customers, who do not need to hire additional plumbing or electrical laborers to complete the project. Up front fees may be required to start construction. While the size and shape of Safe Step walk-in tubs often vary, many of their tubs have the same standard features. Because Safe Step can customize their product to fit what customers need, homeowners rarely need to change the size or layout of their bathroom. 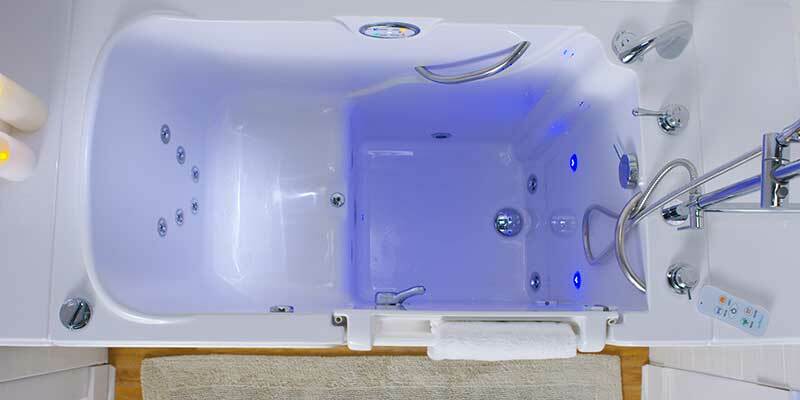 Therapeutic devices are standard on all tubs, including the Dual Hydrotherapy Massage System and Chromotherapy System. Safe Step products have an extensive list of features to provide a safe bathing experience for anyone with mobility issues. Users get into the tub using a side door, shut the sealed door, then fill their bath without having to worry about falling while getting in. The heated seat keeps users warmth while they wait for the tub to fill. As noted earlier, Safe Step Walk-in Tub Co.’s products are an investment, with the cost of the tub or shower unit, modifications to the bathroom, electrical and plumbing, and installation included in the price. Safe Step avoids quoting general prices since nearly every project is unique. To help make the cost more manageable, the company offers a financing plan with approved credit. Before choosing a payment plan, be sure to check interest charges and compare with other credit based options. The company also offers a “Helping Hands Rebate” of up to $1,500 to help offset the lack of Medicare coverage, and discounts for military veterans. Getting an exact quote for a Safe Step tub in your home is free, but you’ll need to request an estimate by completing a form on their website. For guidance on what to look for in the price of a walk-in tub, visit our walk in tub guide. The Safe Step Walk-in Tub Co. covers their products with a lifetime warranty on parts and labor for the original purchaser as long as a company representative completed the job. According to the Safe Step, this warranty covers the tub (including manufacturing defects), door seal, faucets, water pumps, heaters, and blowers. Specific exclusions may apply, and coverage may not pay for all service or labor costs for every repair. There is a two-year warranty on caulking. Safe Step provides customer service via toll-free number at (800) 346-6616 or via chat on their website 24 hours a day. For those interested in buying a tub, a rep will return your call within an hour or two, or you can schedule a time to see one of the many showrooms in the U.S. Those who have already purchased a tub have access to the customer service line from the moment they pay their initial deposit until they are satisfied with the tub installation. This same number will connect them to a representative for any ongoing troubleshooting or warranty claims that may come up. What do Safe Step Reviews say? Customers report being pleased with the responsiveness of the service team in resolving issues with leaks or answering questions that arise over time. Buyers describe Safe Step walk-in tubs as a luxury home bathing experience without sacrificing safety. The perks of owning the bathtub come up frequently from customers with mobility issues, with some reporting a significant relief of pain symptoms from conditions such as rheumatoid arthritis. The Better Business Bureau (BBB) rates this company with an A+, its highest rating. Safe Step has earned this mark by being responsive to customer questions and complaints in its nine years in business. Many of the reviews left by customers are specific to the experience they received at a particular Safe Step dealer and may not be a reflection of service at another location or the brank. The most common complaint received by customers is that the tubs and showers can leak soon after install. It’s not uncommon for a newly installed walk-in tub to need adjusting after some use. Almost all of the verified Safe Step reviews have displayed promptness and professionalism in getting service providers back to the home to make these adjustments under the original lifetime warranty. A few of the complaints by users were related to unclear pricing guidelines. Some customers felt pressured to buy when a representative visited their home to measure the bathroom for appropriate fitting, and some said that figuring the total cost of various models and options was confusing. Most of the verified reviewers that mention price, however, seem satisfied by their overall purchase and refer to the higher-end tubs as a worthwhile investment for their health and well-being. Most of the verified reviewers that mention price, however, seem satisfied by their overall purchase and refer to the higher-end tubs as a worthwhile investment in their health and well-being. Finally, these walk-in tubs can use more water than a standard bathtub, often requiring an upgrade in the hot water system to accommodate the volume. For those reviewers who may not have known this up-front, the extra cost to install the heater was a surprise. Most were able to justify the inconvenience with the perks that a deeper tub can provide, including additional spa jets for a relaxing bathing experience. Customers compared the step-in tubs to having a private hot tub in their bathroom. My home doesn’t have a standard-sized tub. Will my bathroom have to be remodeled to accommodate a walk-in tub? It’s possible that some remodeling will be necessary. Safe Step will determine which tub is best suited for your bathroom, including size, plumbing and electrical needs, fixture placements, and aesthetics. Their trained team members will recommend the appropriate tub or shower for your needs after an inspection of your tub area. Will my existing tub or shower need to be removed first? Yes. The Safe Step team will handle this for you. Their professionals are trained in proper removal and clean up, which is included in the cost. How much are the additional plumbing or electrical charges required for installation? All additional installation tasks that may include additions to your plumbing or electrical systems come bundled in the price and are included in your custom quote. The Safe Step team has membership in the National Association of Home Builders (NAHB) and International Association of Plumbing and Mechanical Officials (IAPMO), and professionals have received extensive training on how to ensure your systems are treated appropriately upon install. Does Medicare or Medicaid cover the cost of a walk-in tub or shower? Currently, no. These programs will only cover the cost of durable medical equipment, which does not include walk-in tubs. What kind of warranty comes with my product and installation? Safe Step guarantees its products and the quality of installation for a lifetime against manufacturer’s defects and performance of the tub, door seal, faucets, water pumps, blowers, and heaters. What else should I know about Safe Step? Safe Step Walk-In Tub Co. is based out of Nashville and has been providing walk-in tubs and showers since 2009. They have several showrooms across the United States and Canada, and their professional sales reps are trained to work with customers to find the right walk-in tub or shower with their existing bathroom floor plan. The company only sells to homeowners and has received the Arthritis Foundation Ease-of-Use Commendation after having their products independently tested. While you’ll need to schedule a home visit to get the exact details on which model of walk-in tub is right for you, this will lead to getting the right fit for your home. Safe Step Walk-In Tub Co. developed a product line to fit almost all budgets. Customers who value American-made products will also love that each tub is made in Tennessee and representatives are available nationwide to assist in your purchase. Call or use the online chat feature on their website to schedule a visit or be directed to one of their many showrooms. If you’re interested in a walk-in tub from Safe Step, call 888-653-9934 or check out their website. If you are thinking of buying this tub I hope you read my review first. This has to be one of the worst installation jobs I have ever seen. It was placed on rotten wood first of all and we jast discovered this after they have to keep coming back to redo caulking. We have followed directions for cleaning with 1 cup of bleach to a full tub every 2 months perfectly since getting the nasty thing. We started noticing black chunks of stuff floating in tub and called and we're told to run cascade through it. This is mold people and since using the tub I have been fighting a yeast infection that regardless of what doctors prescribe will not clear up. We have to continue using cascade now for months. Upon doing this yesterday it was unbelievable what came out of the jets. My wife has pictures and will gladly show them to you if you contact her email **. If you are considering getting one of safe steps tubs I highly recommend you do not buy it unless you want continuous problems. My wife says she would not wash her dog in it. I hope this helps someone else from making this horrible mistake. When my mother was diagnosed with ALS I went from corporate officer to caregiver. I Forest Gumped my way through the experience. One bright spot was the walk-in tubs. It changed mine and my Mother's quality of life. She enjoyed having a bath and your walk in tub made it possible when she lost the use of her legs. The system is amazing. It was easy to have installed. We received some funds from insurance so it was affordable. After a long day I found myself using the tub to relax. My Dad also got one installed in his home. It is perfect for seniors.